We live in a rapidly changing world in which politics is becoming both more and less predictable at the same time: this makes political geography a particularly exciting topic to study. To make sense of the continuities and disruptions within this political world requires a strongly focused yet flexible text. 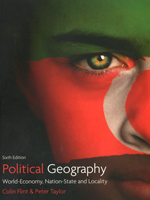 This new (sixth) edition of Peter Taylor’s Political Geography proves itself fit for the task of coping with a frequently and rapidly changing geo-political landscape. Co-authored again with Colin Flint, it retains the intellectual clarity, rigour and vision of previous editions, based upon its world-systems approach. Reflecting the backdrop of the current global climate, this is the Empire, globalization and climate changeedition in which global political change is being driven by three related processes: the role of cities in economic and political networks; the problems facing territorially based notions of democratic politics and citizenship, and the ongoing spectre of war.